Despite the coldest February I can recall at Heronswood, and one of the coldest on record in our region, it is good to remember that there are some plants that simply pay no attention to the discomforts of frigid toes and frosted fingertips. There are always a few stalwarts that arise from hibernation like groggy bears as the day length increases while possessing a ‘damn the cold, lets just get on with it’ attitude; Trillium chloropetalum, Scoliopus bigelovii, Crocus tommasinianus, Primula vulgaris subsp. sibthorpii and, of course, the Hellebores, to name a few. Not many realize however, that there exists an exceptional species of peony with the same brave—some might say foolish—constitution. 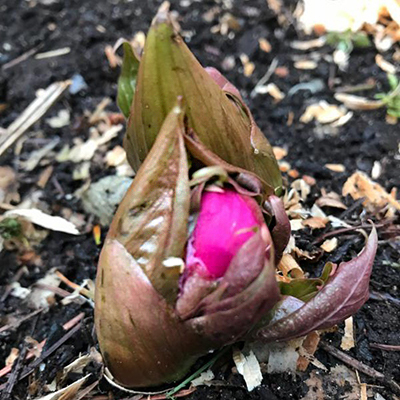 In the woodland at Heronswood, Paeonia mairei began revealing its brightly colored, tightly compressed buds at ground level during the shy days of early February and has continued to emerge during even the most frigid days of the month. Native to the provinces of Central China (Yunnan, Sichuan, Guizhou and Gansu), it occurs in woodland thickets at elevations to over 10,000′. Though it was introduced to western horticulture in 1913 by the French missionary Edouard-Ernest Maire, it has been revered by the people of its native haunts for centuries who refer to it as mei li shao yao, or Beautiful Peony. Taxonomically, botanists consider this species closely related to Paeonia obovata as well as P. mascula. The former, whose seed I have collected in northern Sichuan growing in deep shade, possesses cups of pristine white while the later, growing at Heronswood from seed collected in NE Turkey in 2000, possesses nearly the same precocious nature as P. mairei while presenting pink/red flowers. In my mind, neither compare to its adaptiveness and elegance in flower and foliage. Paeonia mairei‘s goblets of rich purple/pink will reach their zenith in early April, nestled amidst distinctive long and narrow leaflets on stems to 18″. Though not standing alone in its genus for tolerating shade, I think of it as the very best of the lot in this regard. Shade is where it wished to grow. Visit us this weekend as the gardening calendar begins again. You will always leave having discovered another jewel in our collection that had not yet caught your eye. Perhaps this time it will be the flower buds of this bravest of peonies.